This article contains tips for those who are eager to win rating battle with Pikachu. Torkoal SpA 85 Sunny→Eruption is powerful. Wailord SpA 90 Rainy→WaterSpout maybe more powerful?! So, we consider Wailord’s team. Wailord seems to be compatible with Pelipper, because Wailord’s speed is 60(this is fast) and Pelipper can make rainy and use Tailwind. 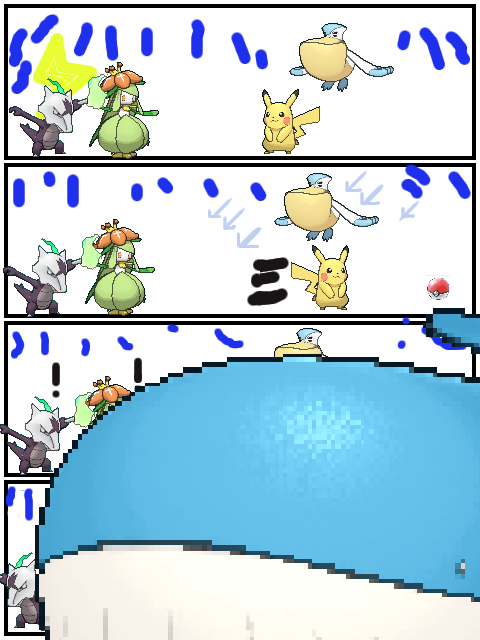 So,we decide to use Pikachu, Wailord, Pelipper. Finally, we choose Tapu koko! Because, Tapu koko can use Thunder in the rain, strengthen Pikachu to use Discharge, and use Water Spout to use Mirror Move. All is completed with this expect Mirror Move. Adjustment: SpA and Spe are MAX. and SpD 4 to counter download. Very huge Whale,Wailord. We say “huge”,but this one is not so big on the 3DS screen. I’m sad. This pokémon is only can use Water Spout. Anyway, look at the Damage Calculation. like those. This power is almost as much as Kingdra’s Hydro Pump with Choice Specs in the rain, and Wailord can damage both of opponents. I think the power of moves is important even when I consider Torkoal team too. It’s important Water Spout is effective in Garchomp, unlike Eruption is not very effective. Also Wailord is able to KO Kartana which Water Spout is not very effective. When only we use Water Spout, we can get the victory! But, we need to create a situation to use Wailord effectively, because it’s speed is 60 and the power reduces to 75% because ranged attack (and as the user’s HP). The concept of this team is Wailord whose ability is tricky plays an active role in double battle. At first, Wailord had Mystic Water. I change items to Choice Specs because Wailord only uses Water Spout. Although choose 4 moves, I use Hydro Pump at most expect Water Spout. Almost pokémon is not so fast in Alola, the squad which doesn’t contain Tapu koko or Garchomp are later than Spe 112. For example, Tapu Fini and Alolan Muk. We don’t need Tailwind and get the victory only Water Spout, when we battle the team. It’s very fun. But, there is a weak point. Wailord is very brittle. Wailord(which 0 defensive EV) seems more than tough than Flygon(which 0 defensive EV) a little bit. Wailord maybe stands after one hit attacked. But, should never be attacked. Because Water Spout power depends on HP. We win the battle almost certainly when Wailord isn’t attacked! Adjustment: SpA and Spe are MAX. To Tailwind and Rain. Actually, Pelipper’s SpA is same as Kingdra! Pelipper has a important role in this team. First move, use Tailwind to perform earlier than opponent. Wailord’s speed is 60(not so fast), and other member also Pelipper are not so fast. Because, this team is weak in Grass. So,we use Hurricane when face Tapu Bulu. Fortunately, Pelipper is faster than tapu bulu(Modest, Sp252). Wide Guard is to protect from like Avalanche, Dazzling Gleam. I considered another move is more useful than Wide Guard. Sometime we won for Wide Guard. I feel Pelipper is not so bad, but hope if Pelipper would be more strong. The pokémon sum of base stats is 440! When Pelipper has Focus Sash, I can’t control at will, because Pelipper is not strong. The power is not enough, and speed is 65 either. But, there is a big advantage that can use Tailwind and Rain for standard WCS team. So, it’s so hard to win when face to Torkoal(Sunny), Gigalith(Sand stream), Trick Room team. It’s difficult to switch many time, because Pelipper is not tough. Then we share Def EVs or SpD EVs? But, there are many Electric pokemon in WCS. What I’m trying to say is we need to support Pelipper . A Pikachu. It’s cute. A Pikachu squeaks like Pikaaaaa, Buheeee when a trainer drops a Poké Bean on Pokémon Refresh. Please try it. The Pikachu was adopted to support Pelipper’s move Tailwind by Fake out and guard Pelipper against electric moves by lightning rod. Pikachu is so weak defense, so Pikachu only want to move Fake Out then Tailwind lasts 3 turn and switch Wailord. Originally, Pikachu was going to adopted as little bit stronger Pokémon that like a Smeargle. However, Pikachu is strong too much. Too high power this is. The above Pikachu is the same generation6’ Pikachu. The ground often become electric terrain by Tapu koko’s ability. Lightning Rod draws electric moves many times. Pikachu doesn’t have any presence. As above, based on three factors, Pinachu was hugely successful. The ground often become electric terrain by Tapu koko’s ability.First, Electric terrain is a point. No wonder my Tapu Koko leads to the ability many times. Furthermore, opponent’s Tapu Koko deployed the terrain on their own.Then the following point is most important on this report.Timid nature 252 SpA Tapu Koko Dazzling Gleam with Life orb (the max damage on a double battle is 109) vs. 0 HP / 0 SpD Pikachu: 110-70 — Will never 1HKO!! !If you use timid Tapu Koko on your squad and add Dazzling Gleam into the moves, you adopted the move can not even faint a Pikachu! !Then Pikachu can use a move against Tapu Koko at least.How much power is Pikachu’s Thunder on the Electric terrain?Modest nature 252 SpA Pikachu Thunder with Light Ball vs. 0 HP / 0 SpD Tapu Koko: 75%~88% damage on the electric terrain.Is it really “not very effective” damage?And if Tapu Koko moves Discharge to give the priority to faint the Pelipper.Modest nature 252 SpA Pikachu Thunder with Light Ball and spA+1 vs. 0 HP / 0 SpD Tapu Koko: 113%~133% damage on the electric terrain. OHKO. Everyone made a big mistake. I don’t know why opponent’s Thunderbolt often attack against my Pikachu. And when squad adopted Aloran Marowak or Garchomp, many electric Pokémon adopted Discharge. That Pokémon Discharge to attack Pelipper without Pikachu’s ability. And Pikachu’s lightning rod draws it! Yeah! The Pikachu doesn’t have any presence. In a battle, Pikachu was forgotten and next Pokémon keep attacked. Finally, Pikachu rushed and fainted three Pokémon in a battle several times. Possibly, everyone guesses Pikachu doesn’t have power. For example, Pikachu held Pikanium Z “Catastropika”. Hidden Power Ice: 0 HP/ 0 spD Garchomp OHKO. Grass Knot：HP252 Gigalith OHKO under the rain. Grass Knot：Gastrodon chance to 2HKO. Pikachu’s Fake Out for Garchomp and Pelipper’s Tailwind make so easy situation to faint Garchomp. Recently Garchomp is defensive though. There is not many Kangaskhan in the WCS rule. Then Pokémon use Fake Out in the WCS rule are Incineroar, smeargle and Aloran Raichu etc. so Pikachu can safely Fake Out. Pikachu got some advantage against Aloran Raichu because Pikachu draws electric moves. The following is a summary of the Pikachu. Pikachu can use high power moves by electric terrain. Furthermore, Lightning Rod moves easily because many Discharge used in this rule. Pikachu can safely Fake Out. As three points, Pikachu is strong. Everyone, let’s enjoy the battle with not only Raichu but also Pikachu! Pikachu has opponents Discharge easily next Pelipper! Let Pelipper hold Focus Sash! Please be careful Extreme Speed OHKO by Arcanine held Life Orb. Move：Thunder, Discharge, Dazzling Gleam, Protect. Tapu koko is the guardian deity of Melemele Island, but can’t do OHKO vs. Pikachu by Dazzling Gleam. The calu of SpA is same as Magnemite. I choose this to use Thunder, because rain. There is not important reason. Tapu koko use Discharge to make Pikachu strong, Dazzling Gleam to a little damage opponent. The power of Thunder with Life Orb in the Electric Surge is very poewrful. But,sometime electric moves are drew by Pikachu. Truthfully, I wanted Tapu koko use Water Spout by Mirror Move. But this move is not strong. So, I choose Protect. I knew it. I said only power till now, while There is an advantage this pokémon’s strong point is very speedy. If this pokémon had high speed and high power, this is not fair. However, Dazzling Gleam (this move knocks out Garchomp) is not effective for it. We need to consider this move. Adjustment: OHKO Garchomp by Leaf Blade. OHKO Tapu Lele by Smart Strike. The lests are SpD. Fastest. One of a UB which is much talked about recently. Kartana. I choose this to supplement this team. I almost select this pokémon, because the types are Grass and Steel, and speedy. When I select this, just attack. But, I learned powerful attack is very simple and strong from this. It took a long time that I dicide to use “Sacred Sword” (instead of Razor Leaf, Guillotine). The power of Razor Leaf is stronger than Dazzling Gleam of Tapu koko, so I thought Kartana uses Razor Leaf is not so bad. Then, I don’t use Razor Leaf. I was enthusiastic I used Guillotine instead of Razor Leaf, for we could knock out Celesteela! Finally, Pikachu knocks out Celesteela. And, we can’t repeat to use Guillotine. Then, I don’t use Guillotine. Finally, I decided Sacred Sword to counter Kartana the same as. Also Drampa. I felt Kartana often faced Arcanine which ability is Intimidate and type is fire even though in rainy. Kartana is steal pokemon which can OHKO Garchomp certainly. This pokémon should be strong. With Z power, with Assault Vest, there are many way to use. It’s amazing we can get 4 Kartana! What? You traded 2 Kartana on GTS? Oh… I understand how you feel. Huh? You have 1004 Kartana? I can’t understand you. ←I like Busted Form than Disguised. I can’t decide this pokémon easily. This Mimikyu uses Taunt. if there is a chance to knock out a Tapu Lele. This might be not good how to construct a team. However, I use this pokémon on a idea that Mimikyu can definitely use Taunt. Mimikyu prevented pokémons such as Oranguru, Porygon2, Smeargle and Pelipper from using support moves, Trick Room and Tailwind. However, there is a problem in Porygon2, because my team is not tough. It’s hard to win just when Porygon2 use Tri Attack. And, Mimikyu can’t knock out Porygon2. I feel the idea of the pokémon which use Trick Room are weak in ghost type is past one. First, I selected Shadow Sneak. But, I rarely use it. So, I selected Swords Dance. When we face Oranguru almost has Mental Herb, Pikachu uses Fake Out and Mimikyu uses Twinkle Tackle after Swords Dance. When we face Alolan Raichu first move, I wanna to choose Mimikyu first. However, it’s hard for Pikachu to fight Alolan Raichu. It might be good that we can use Taunt. Pikachu do Fake out, Pelipper use Tailwind. After that, we fight with Pikachu and Pelipper. When either of them is knocked out, Wailord descends and trys to end the game. This is not problrem we face Alolan Ninetales or Vanilluxe, when Pelipper prevent them from snowing. Especially, we need to use this basic selecting when we face Garchomp + Tapu koko. Pikachu uses Fake Out for Garchomp. After Tailwind, we are able to win the game easily. This is a problem we face Tapu Lele, because we can’t use Fake out. I think it’s good that first select Kartana (faster than Tapu Lele) and Pelipper uses Tailwind or Hydro Pump. We prevent opponent from using Trick room by Fake out or Taunt. However, we are not sure to win when face Poligon2. We need to knock out Poligon2 by Wailord or Kartana quickly. If not, opponent will use Trick room again. Also, Mimikyu can use Swords Dance. Good luck. This combination is difficult for one to deal with. Tapu Koko uses Protect, and I hope Mimikyu knocks out Lilligant. We don’t sleep, because Tapu Koko makes Electric Terrain. It will be fine if both of opponent don’t use Protect. The timing when we change Pelipper is difficult. I feel good the last pokémon is Kartana, because opponent often use Tapu Lele next. Basically, it will be fine that we select Pikachu and Pelipper first. However, there is a problem that when we face Tapu Lele or Torkoal. If not Pelipper, it’s difficult for us to win. Because, Pikachu and Tapu Koko only use Thunder(Accuracy 70). The picture is “He looks loser after take a photo”. We started on New Year’s Eve, and continued to fight until New Year’s day. I fell just one step short of 1900. I tried to fight this team about 100 times. First, I kept 1650~1700. After 1700, I could reach to 1850 immediately. It was not so hard to keep 1800s. After all, I felt Pikachu was a strong pokémon. Just for your information, I would win the next fight of this picture, if I’ve selected my Pikachu. How vexing! Wailord with Tailwind is very effective to fight standard team. Then, we could keep 1800s(almost teams are so). However, it’s so hard for us from facing Gigalith + Stoutland. So, we need to check the dog which opponent uses Stoutland or Arcanine. I want speedy pokémon, because Tailwind turns is not long. Nothing is more exciting than pokémon which I select work out as expected. However, there is a problem. The durability of my team are very low. I wanna use pokemon whose base stats is more high next. Bace stats of SpD except Mimikyu are 45,70,50,75,31. So, they fall down easily! Gahaha! Now, we have a chance to use Pikachu, because we can’t use normal Raichu this rule. Pikachu is so cute, and I enjoyed fighting with it. That’s all about it. Let’s have fun this year, too. Hello. 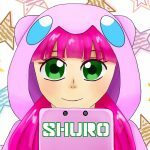 We are shuro(シュロ) and Mari(まり) We are just a translator, not Author. Maybe, there are some mistakes, since we are not native English speaker. Please comment when you notice our mistakes. Below is our QR rental teams!! check’em out!